You’ve been dreaming about your wedding day - lets be honest... since you were like five. You know exactly what you want it to look like and feel like. You are sure this will be the most amazing day of your life. But you didn’t realize how much time and work was involved in planning what will probably be the biggest event of your life. What if I told you - you could have your DREAM Wedding and have a ton of fun planning it? Full coordination with Zero Stress & no unnecessary arguments with your soon-to-be husband or mother about wedding details. In fact, instead your just completely enjoying your engagement and having fun picking out florals and dresses and creating specialty one of a kind bride and groom cocktails. You have a full team of wedding experts working behind you together to orchestrate the wedding of your dreams and an event of a lifetime.There are no to-do lists for you to handle today or worrying about a million details. If you are reading this - you are probably secretly wishing - this could be you. So what now? Is this really an option? Of course it is. It’s up to you to decide if it is really worth it for you - or not. We are not in the business of making a pretty penny off of you - with our Full Coordination package you really do get everything you paid for and more. But more importantly,you have the wedding of your Dreams and you get to enjoy EVERY minute of the entire process. Maybe you just don’t have enough time to plan the event of a lifetime or maybe you just feel more comfortable having a professional handle your big day and you really just want to enjoy your engagement. Or, perhaps you started to plan your wedding but got a bit overwhelmed with all the details... Whatever the case may be, we’re here to help. After all, the entire process goes by so quickly - don’t you want to enjoy it? Want to see more details on the Full Coordination Package? In addition to coordinating vendors, we come up with and execute a full design based on your ideas. We assist by taking your vision on style, colors, and theme and pull all of it together to create the best possible visual experience for your dream Hawaii Wedding. We come up with look sheets and samples based on your theme and you decide which direction we go in. We follow through with the organization and execution of all design ideas. We have a professional graphic and event designer at your beck and call. Discounted rates are available for design work. Just a side note, most wedding coordination companies do not include event design or graphic design. Another service included with Full Coordination is Timeline Development. We take your ideas of how you’d like your wedding to flow and create a customized itinerary of your entire day, from the moment you wake up until the very end when everything shuts down. We fill in every detail from where the bride gets ready, to when the cake arrives, to who’s the next person giving a toast, to surprises given by the groom for the bride, everything. We make sure everything and everyone is where they need to be and when they need to be there. Every little detail that goes into making your wedding day the best ever is thought out and written into this timeline down to the minute. This may seem a little obsessive but we are overly thorough to ensure that everything flows seamlessly. We can throw in ideas of how to add “life” to your reception to keeps guests entertained and happy. We have seen many weddings and know first hand how important a good timeline is to ensuring an amazing day. With each of our clients, the most important thing to us is that first, the bride and groom have their best day ever, and second, that their guests have just as wonderful of a time. Along with creating a customized timeline, we work closely with your master of ceremony ahead of time to go over their speeches and help them make adjustments if necessary so that there is a nice flow to the reception and no awkward moments. We do our best to ensure that your Emcee(s) are prepared and create a good impression for you and your guests. A important element, but often forgotten about, is Event Layout. We compose a plan that is most ideal for your wedding, making sure that the flow of spaces is just right, that you and your guests are not cramped together or so spaced out that everyone feels disconnected. A detailed event layout is designed to scale. We create seating charts, for both the ceremony and reception. All you have to do as a couple is to fill in your guests accordingly. Just before your big day, we help coordinate the rehearsal, so that everyone involved in the ceremony knows where they need to be. We follow up with your bridesmaids, groomsmen, toasters, speech-givers, deejays, prayer-givers, parents of the flower girl and ring bearer, etc..and let them know exactly what to expect that day, where to go, and how they fit into the timeline. Your big day has finally arrived and you feel FABULOUS! And, What is there left to do? Nothing, absolutely nothing. As the bride and groom, all you’re expected to do is show up, get married, and have fun... enjoying the Hawaii Wedding of your dreams! While you sit back, relax and enjoy your day, we continue to make sure everything goes according to plan. We strive to be proactive and tie up any loose ends before they become a problem. Nothing is ever perfect, but we try our best to resolve any issue that may come up. If there’s a problem, we fix it. We are there from the start to the very end that day. We visit with the bride and groom in the morning to check up on any concerns. We are there for the set up of the ceremony and reception spaces - guest tables, florals, settings, table numbers, name-tag, centerpieces, decorations, etc. We coordinate the various vendors. Even before your wedding day, all of your vendors would already have the information they need to perform their services top notch. They’ll have the event layout, timeline, song selections, portrait list, any special instructions and notes. Everyone is in the loop of how your day will go come about. Essentially we do all the work, with a few minor exceptions, i.e. writing vows. We present you with the best options and you make the decisions. Your involvement with the planning process will be more along the lines of “Yes, I want those centerpieces, that invitation, and this venue...”. We keep you in the loop at all times with photos and progress reports, but you will never see the back-end work we do in an effort to keep things as simple as possible for you. We are always available if you have any questions or if you have any new big ideas. This package was created so that we do all the work and you get to enjoy the process and make all the fun decisions. We always do a complimentary initial consultation with each couple to get to know them and get a good feel for their vision. As the date draws closer we will be in communication mostly through e-mail but we may also schedule phone or in-person meetings as needed. There is always one BIG final detail meeting about a month prior to your wedding day to go over all final details. Assist with creating a budget that lists all your different vendors and expenses. Budget management can reflect projected expenses, which you may not be aware of and give you a clear picture of where your money is going. As much or as little design assistance as you need. Includes one complimentary design meeting, if requested, to discuss any and all design related ideas. If you already have a Pinterest Board we will follow you and help bring your ideas to life. If you do not, we assist with creating a Pinterest Account, Pinterest Board for all your wedding ideas. We research and contribute ideas/pins to your wedding board to help create a unique look and feel for your special day. You can save a ton by incorporating DIY projects into your wedding. We can advise you of the best places to get different materials and items for the DIY projects and you can employ your bridal party to lend a hand in making these “from the heart” handcrafted projects. We assist you with creating a wedding website based on your theme and colors. Once we have set up the basics, we hand it over to you to monitor and upkeep. Based on your style and budget, we’ll recommend different stationery sets for your all your wedding needs, including but not limited to save the dates, invitations, RSVP cards, thank you cards. Once all RSVPs are collected we can put into spreadsheet and organize by last name, includes addresses, # of guests, food choices, etc. Option to have RSVP’s send directly to BDE for Full Coordination Packages only. * Please note, each venue is different, we will create a detailed site plan to scale to fit your details and needs. We put everything together on a master timeline. Every single what, where, when and how for the bride and groom, vendors and coordinators will be scheduled down to the minute for precision, all music cues for DJ, notes and speech for Emcee, list of speech givers, order of procession, instructions for the entire vendor list and bridal party will be spelled out. 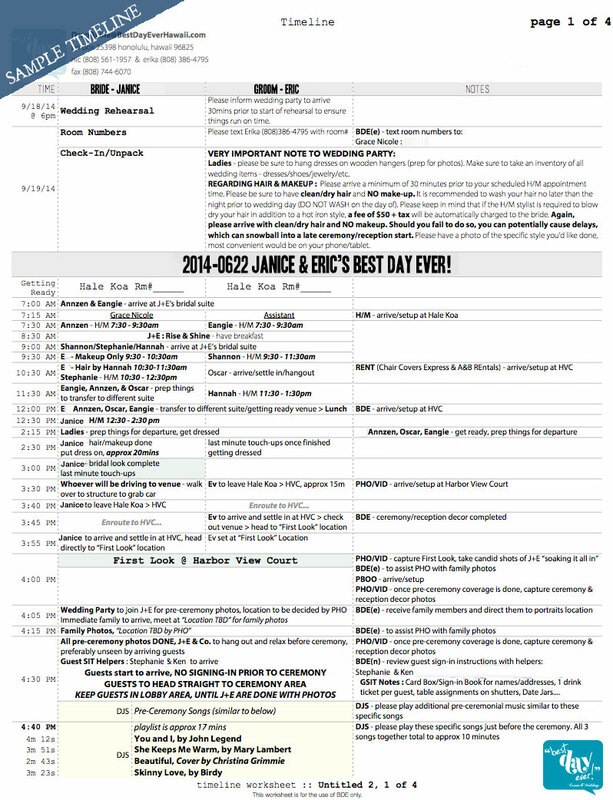 We distribute this timeline to all vendors, venue, speech givers, and anyone else who needs to be "in the know". * Please note, this sample only shows the first page of the timeline, most of our timelines are between 2 and 7 pages long. We'll meet with your MC in advance to go over the reception timeline and his/her speech to ensure that everything runs smoothly and to eliminate any awkward moments on the day of. We will your bridal party, friends and family lending a hand with the wedding through email or over the phone to ensure that everyone involved is in the loop and has the proper information on what time to arrive, where to meet, etc. Assist with creating gift baskets or giveaways for out of town guests or any other special guests you'd like to recognize. So much goes into planning your wedding, once we've received all your wedding information - contracts, balances, ideas, timelines etc. we'll schedule an in-depth meeting to go through everything. This final meeting is usually held about a month or so prior to your wedding day. Two additional in person meetings may be scheduled to go over misc. details, as needed.